You know Music Choice, the provider of beloved music-only cable channels from Adult Top 40 to Salsa Y Merengue? Well, they're coming to TiVo with nearly 1,000 music videos at launch, and several thousand in all. You can access them at no charge through the TiVoCast interface. Remember videos? As if to remind us, TiVo asked original MTV VJ Martha Quinn for a comment: "In a way, I see this as a new video revolution whereby fans pick the videos they want to watch and when." Sounds like Martha's just convinced herself to retire. (Awww, we love you Martha!) No word on the music-only channels, though, and we can't live without our Underground Rap (Uncensored) channel. Jump for press release. ALVISO, Calif. - December 5, 2007— TiVo (NASDAQ: TIVO), the creator of and a leader in television services for digital video recorders (DVRs), and Music Choice, the award-winning multi-platform music network, today announced the immediate availability of Music Choice on broadband-connected TiVo® DVRs. Music Choice will deliver its wide-ranging catalog of several thousand music videos and original programming to the television through the TiVoCast service. At launch nearly a thousand video titles are available and this number is expected to grow significantly in the coming weeks. "Be it music, movies or memories, our broadband strategy continues to focus on delivering consumers what they want, when they want it," said Tara Maitra, Vice President and GM of Content Services for TiVo Inc. "By bringing TiVo users Music Choice, we're giving our subscribers access to the most extensive music offering available, delivering thousands of music videos straight to the TV. We think this service will be extremely popular among the TiVo audience." "We are thrilled to make our highly-popular music-related content available to TiVo users," said Christina Tancredi, Executive Vice President of Music Choice. "This exciting relationship with TiVo allows us to extend the reach of our content to even more consumers across the country, and we're confident once TiVo users try it, they'll be hooked." By combining the TiVo interface with Music Choice content, TiVo has quickly emerged as the entertainment platform for music lovers. TiVo subscribers will be able to browse through a variety of music genres using TiVo's easy-to-use and intuitive search interface, breezing through Music Choice content, featuring Rock, Pop, Hip Hop, R&B, Country, Latino, and Kids' videos, Music Choice Originals featuring today's hottest established and emerging artists, as well as daily entertainment news clips. When considering the robust Music Choice offering and the recently announced availability of Rhapsody, with the current Internet radio offering from Live365, TiVo users truly have a 360-degree musical playground. Users can conceivably watch a documentary about an artist, add the artist to a playlist for their mobile device and then watch that artist over and over via music video. Legendary VJ and music personality Martha Quinn has been at the forefront of music entertainment since her days as one of the most recognizable VJs in the world, and is one of many music lovers excited about the new feature on TiVo. From the time I started as a VJ, one thing has been obvious - music fans love to see their favorite artists via videos," said Quinn, one of the first MTV VJs and now host of a popular Sirius satellite radio music show. "In a way, I see this as a new video revolution whereby fans pick the videos they want to watch and when, both saving and creating the video stars of today. 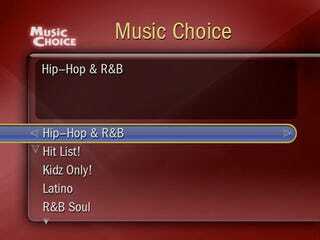 TiVo and Music Choice have delivered exactly what fans have been asking for." All of the content on TiVoCast, including Music Choice, is offered at no additional charge as part of the existing TiVo service subscription fee. TiVo subscribers can access TiVoCast content through TiVo Central. TiVo boxes are available at leading consumer electronic retailers including Best Buy and Circuit City. See www.TiVo.com for details.